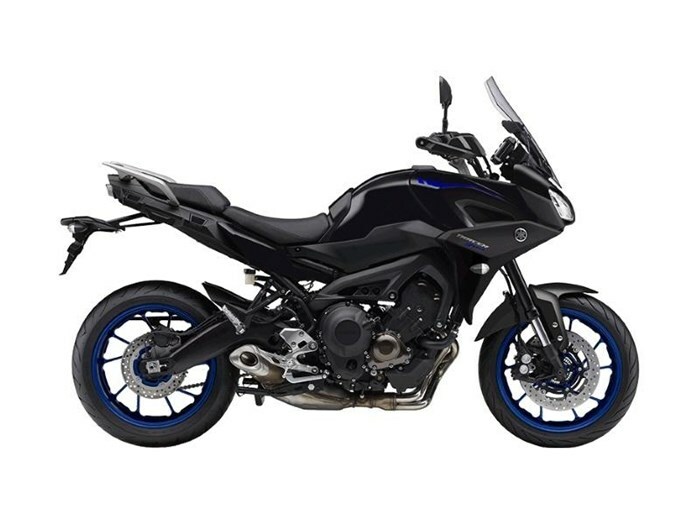 2018 Yamaha Tracer 900 CONQUER ROAD With the new 2018 Tracer 900, Yamaha has taken its popular FJ-09 sport touring platform and upped the ante with even greater comfort, performance and value. New styling, improved touring features and a new swingarm are among the highlights of the 2018 Tracer 900. With sport-minded performance and relaxed ergonomics, the Tracer 900 can tackle the twisties, the open road or the daily commute with poise. POWER The 2018 Tracer 900 utilizes a torquey and powerful 847 cc "CP3" (Crossplane Concept) engine that offers usable low-end torque and enough power to satisfy the most experienced sport rider. A Tracer-specific Yamaha D-Mode system allows the rider to adjust power delivery based on conditions and preferences. VERSATILITY The Tracer 900 takes the FJ-09's versatile nature to the next level. The relaxed, upright riding position is enhanced by a new seat shape and design, revised handlebar setup, new passenger footpegs and a larger windscreen. A longer swingarm improves cornering and drive characteristics, while styling has been freshened up with revised bodywork and a new rear fender. Standard ABS, traction control, D-Modes and an 18-litre tank further position the 2018 Tracer 900 as an incredibly versatile sport touring machine offering tremendous value at an attractive price. Features may include: ENGINE Slim, compact, 847cc, DOHC, 4-valve, liquid-cooled, 42.5 degree inclined, inline-three cylinder engine. The engine has been tuned to provide plenty of low & mid-range torque with strong yet linear throttle response. 4-valve, downdraft style combustion chamber Valve adjustment intervals are every 42,000 kms. 120 degree crankshaft with "even" 240 degree firing order. Lightweight "coupling force balancer" is used to reduce engine vibration for excellent rider comfort. "Fracture split" connecting rods feature a "nut less" design. Lightweight, forged, aluminum short skirt pistons. Direct ceramic composite plated cylinder uses "liner less" bores Offset cylinder design One-piece cylinder and upper crankcase assembly CHASSIS / SUSPENSION CF (Controlled Filling) die cast, twin spar, diamond-type, aluminum frame. The riding position is one of the most important features of the Tracer 900 chassis. Detachable, round tube steel rear sub frame. New externally mounted, C.F. (Controlled Filling) die cast aluminum, truss-type rear swingarm. Adjustable, 41mm inverted cartridge style fork offers 137mm (5.4") of wheel travel. Lightweight, aluminum upper & lower triple clamps. Adjustable link Monocross rear suspension with 130 mm (5.1") of wheel travel. ABS equipped, dual 298mm floating front discs squeezed by radial mount, Advic, mono-block, 4-piston calipers. ABS equipped, 245mm rear disc is squeezed by a lightweight single piston, slide-type Nissin caliper. ABS or Anti-Lock Braking System. Lightweight, cast-aluminum 10-spoke wheels.